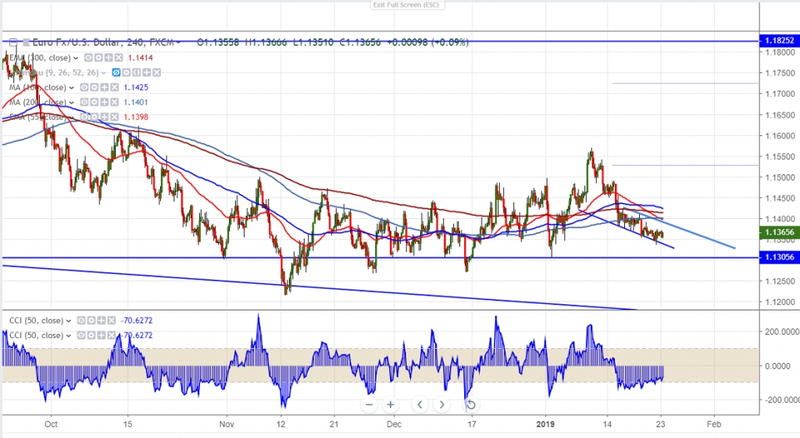 EURUSD continues to trade lower and is consolidating after hitting low of 1.13450.Markets eye ECB monetary policy which is to be held tomorrow for further weakness. ECB is set to meet for the first time after ending of purchasing program tomorrow. It is expected to be dovish as Eurozone slowdown much stronger than expected and Brexit uncertainties.The spread between USD and German 2 year has rose to 320 basis point highest level since Dec 21st .The pair hits high of 1.13740 and is currently trading around 1.13622. On the lower side near term major support is around 1.1300 and any violation below will drag the pair to next level till 1.12670/1.12180. Any convincing break below 1.1200 confirms further weakness. The minor intraday bullishness can be seen only above 1.13750 and any break above targets 1.1415/1.14300 (200- H MA)./1.14596/1.1486. Any further bullishness only above 1.1500 level. It is good to sell on rallies around 1.1375-78 with SL around 1.1420 for the TP of 1.12670/1.12180.